I. Am. OBSESSED. I was eyeing this bag for a while and finally took the plunge in mid-January. It's a big, black bag (aka my ideal purse for my color palette and all the stuff I lug around daily), but the drawstring is a unique element that makes it an elevated basic. Regardless of the season, commuting on public transit can leave you a little oily. The Boscia blotting sheets wick away any shine and they smell so nice, an added plus. Carmex has remained loyal to me my whole life. No other lip treatment really compares, so a tube of this is a staple in my bag at all times. Can't really remember the last time I bought a full bottle of perfume because I love rollerball/travel perfumes that much. My boyfriend, Evan, gifted me the Marc Jacobs Daisy Dream travel spray, which I love. I also recently bought one from Zara for all of $5, and it's so good (don't sleep on Zara fragrances, y'all). This case was too cute not to buy, especially considering I used to frequently tell my friends to "take two chill pills and call me in the morning." Evan's dad had this extra charging case lying around, so his trash became my (free) treasure. This is super helpful on flights, during bus rides when the outlets aren't working or on unexpectedly long days when you're out and about without a place to charge your phone. Nobody wants to be ashy, point blank. 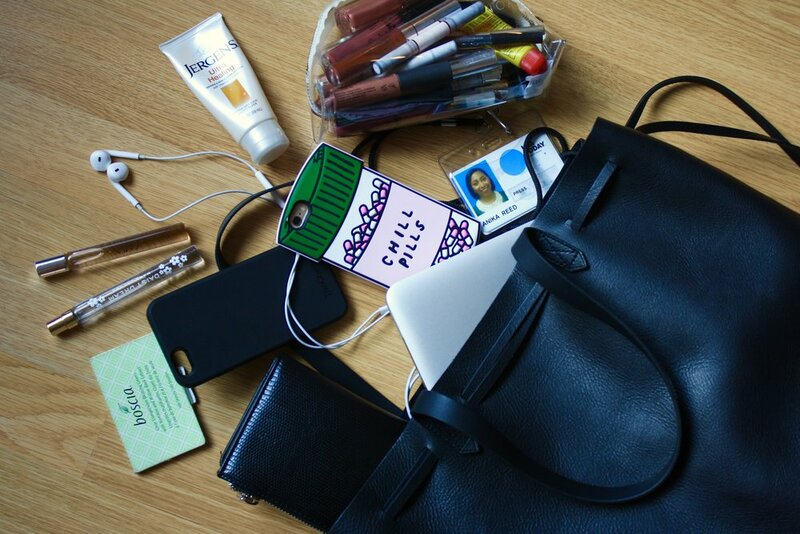 Let me know what your favorite bag is and your must-haves for your work day in the comments!